A Long Break – and a Giveaway! Well, it’s been a while! Let’s just say that it was a tough semester but I got through it with flying colors – and most of my sanity intact. (My husband may say otherwise.) Woo-hoo! In addition to school I was also volunteering and started working a couple of days per week at a hospital. So it’s been a blur, but I am finally beginning to feel like I can see straight again. I am only taking one class during this summer semester and working two days a week so I should have a little extra time! Yay! I might actually be able to cook and blog about it again. The past few months we’ve depended on more convenience foods than usual due to my crazy schedule. Dinners weren’t quite as elaborate as they had been. As well, there was one day per week this past semester where I was on campus the entire day and so I would bring a lunch and multiple snacks to keep me full and gluten free. I enjoyed using my thermos to bring hot or cold foods to eat, whether they were dinner leftovers, a can of soup or a heated up frozen dinner. One of those items that I would make and stick in my thermos was Saffron Road’s frozen entrees. They have both vegetarian and non-vegetarian meals. I buy both, the vegetarian ones for both of us and the non-vegetarian ones for me. I started buying the non-vegetarian ones when my local grocery store had them on sale since they say right on the package “Gluten Free Certified” by GFCO. (Not every single one of their products are certified GF but the vast majority are, please check out their FAQ’s for more information.) And I also could feel good about eating these meaty meals because the animals are humanely raised. Recently I was offered some free samples of their vegetarian frozen entrees and I was game. Unfortunately, finding the vegetarian entrees was a bit more challenging for me in this not-so-vegetarian-friendly, cattle-heavy state! I don’t often venture to Whole Foods but I was finally able to find the vegetarian entrees there. They had two of the vegetarian entrees to choose from: Manchurian Dumplings and Chana Saag (but the company produces many others). Look! You can even see the little GFCO stamp of approval in the bottom right corner! The dumplings were intriguing and different. They are made of rice flour and vegetables and they tasted good. But I expected them to be more dumpling-like, in that they would have stayed together on my fork, more like a meatball would. Instead, they sort of crumbled when I tried to stab one with my fork. Despite this, the flavor was good and although it says spicy on the package, I didn’t find it to be especially spicy, although others might. I liked the tangy sauce as it had an interesting flavor profile. The basmati rice was perfectly cooked (surprising for a microwaved entree). It should also be noted that this entree is vegan – no animal products whatsoever. It comes in at 340 calories, mainly from the generous serving of rice, and only 6 g of protein. In the end, it was a tasty entree but not one I would likely buy again since it didn’t keep me very full for long. I liked the unique flavor and concept but it didn’t pan out as well as I had hoped. The other entree was the Chana Saag, chickpeas in spinach, with cumin rice. This entree is vegetarian, it does contain dairy in the form of cream, as is typical of saag. 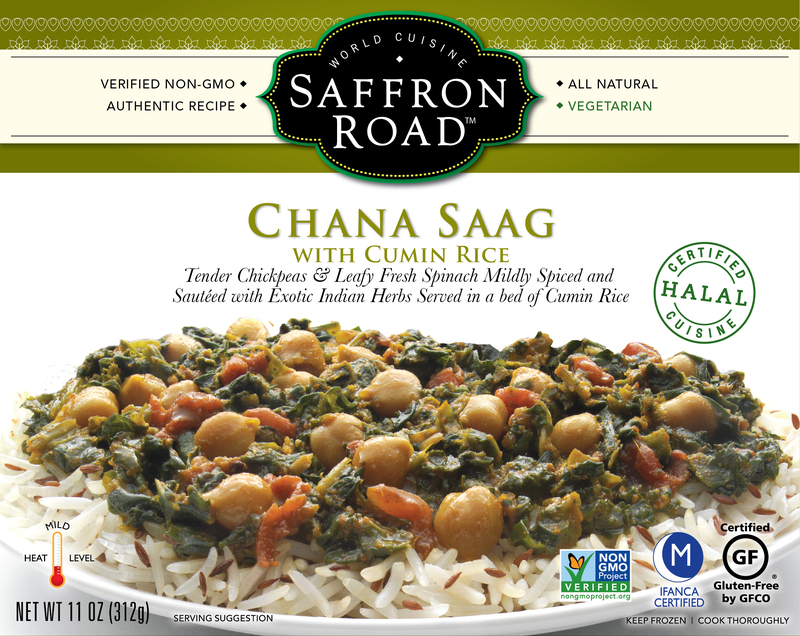 This one was more my style as I love chickpeas (chana) and I love saag. And the cumin rice was dynamite. Again, the basmati rice was light and fluffy and nicely flavored. I could recommend this entree to almost anyone new to Indian flavors as it is not spicy, although it does have a lot of flavor from spices (it’s different, you know?). This one came in at 420 calories, more than the dumplings but also 12g of protein, since the chickpeas are the star of the show here. This entree was more filling although I did go ahead and throw it over some fresh greens once it was cooked. I often do this with a frozen entree, to get more bang for my buck and to fill me up. (It’s something I learned from my time at Weight Watchers.) You can use anything, mixed salad greens, lightly steamed kale, spinach, etc. I like how when I spoon the hot entree over the greens it lightly wilts them. Try it! I will definitely buy the Chana Saag again. And I will also continue to buy the meaty entrees for myself for emergencies. 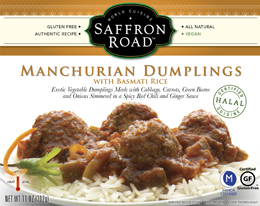 So now for the GIVEAWAY – Saffron Road is offering one of my readers coupons for three free frozen entrees. And you can get either the meat-based or vegetarian entrees, your choice. All you have to do is visit the Saffron Road website and then come back here and indicate in the comments below which of their frozen entrees you’d be interested in trying. This giveaway will close next Wednesday, June 12th at midnight, mountain time. The winner will be notified via email on Thursday, June 13th. Also, when you’re over on their website, check out the flavored crunchy chickpeas!! They sound awesome – and all three flavors are GF. I love making my own but haven’t done it in quite some time. I am keeping my eyes peeled for these! *Products were provided free of charge but the opinions expressed here are my own.